Acne is one of the most common skin concerns women face globally. If you're lucky, a small bout of hormonal acne will strike you in your teens and that's about it. Acne is so much more than blemishes and an occasional breakout. Acne is increasingly linked to anxiety, depression and suicide in teens and even adults. Acne sometimes hits when you've crossed puberty and you're well into adulthood. Adult acne is harder to deal with, mentally emotionally and physically. 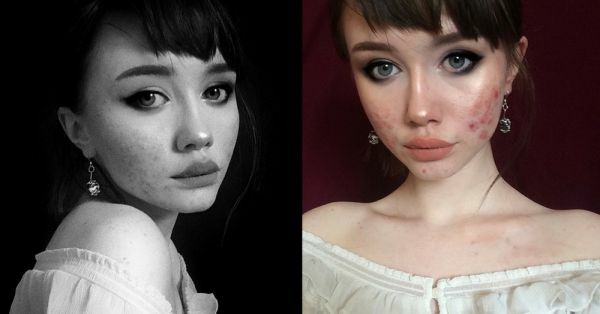 This Instagrammer, Hailey Wait documented her long and painful battle with acne in the most inspiring way. If you've suffered from acne, this beautiful girl may just inspire you to do the unthinkable—leave the house without make-up and embrace yourself, imperfections and all. Hailey shows you the importance of embracing yourself, no matter what the imperfections may be and be the BEST version of you. She shows you the importance of NOT giving into all the bullying and shaming and being comfortable in your own skin! In a beautiful message to her followers, Hailey says "Reminder, acne doesn't make you ugly a heart full of hate does. I've heard your stories and seen more and more of you embrace yourselves for who you are, and to me, that’s the most beautiful thing in the whole world. You aren’t flawless, and neither am I. None of us are, and you don’t need to be flawless to be loved and accepted as a human being. We all have imperfections and we are all capable of greater things beyond our appearances"
Acne is hard and if you've experienced it you would know that it goes deeper than just the physical scarring. As a person who suffers from a *sudden* burst of cystic acne, I KNOW the anxiety and insecurity it can cause. If there's anything I've picked up from Hailey's journey it is that I NEED to learn to be comfortable in my own skin and not wake up and think about covering up my breakouts and blemishes. The worst thing you can do for your skin is to constantly cover it with foundation. I'm still trying to wrap my head around stepping out of the house without make-up on. Just know that you're not alone! Hailey gives out a very important message on Instagram that I believe we all MUST know, "There’s something I worry about a lot and I’m sure others might feel the same, especially if you suffer from any chronic illnesses or mental illnesses when you start to feel absolutely hopeless. I don’t feel comfortable going into my own personal details necessarily but I’m posting this as a reminder that if you are struggling, you’re not alone!! I have this perpetual fear that I may never get better and that all the years of fighting really aren’t worth it anymore. I’m afraid of relationships at times because I hate making the other person worry, and I don’t want to have my partner constantly having to care for me in the future. I don’t want to live with my symptoms forever. I want to be able to go outside and go for a run, to be able to be around other people without feeling trapped or that something bad could happen at any moment. I’m here for every single one of you that are struggling and I hope you know that you’re not alone." What do you think? Tell us in the comments' below!